In the pre-television era, radio was king of the airwaves. In Fort Wayne, WOWO wore the brightest crown. The station certainly sprang from humble origins. 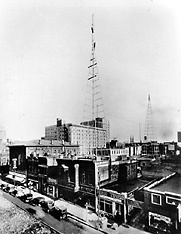 WOWO went on the air in 1925, broadcasting from studios on the second floor of the Main Auto Supply Co. at 215 W. Main St. In those early years, the station broadcast with a power of just 250 watts, instead of the 50,000 watts of today's transmitter. 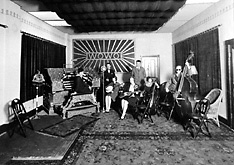 And WOWO had to share its Main Street studios with radio station WGL - Fort Wayne's first station, which began broadcasting on Jan. 24, 1924, using the call letters of WHBJ. WGL is still on the air today, but its name change makes WOWO the Summit City radio station with the oldest continuous call letters. Sam DeVincent, who went to work for WOWO as a musician in 1945, remembers that in those early days of radio, little recorded music was available. So stations had to create live music - which WOWO did, through several bands such as the Hoosier Hotshots and Nancy Lee and the Hilltoppers. The Hilltoppers are still performing today. Live music programs which were carried coast to coast by network feed originated in the WOWO studios. Locally produced dramas also were aired. The two studios were located in the same building because of one man: Frederick Zeig. Zeig, who was president of Main Auto Supply, helped get WOWO going and in 1928 he acquired WGL as well. Helping Zeig get WOWO rolling was Gunnar Elliott, who was a salesman at Main Auto, a restaurant owner, sports enthusiast and later a beer distributor. Elliott also played in the WOWO studio band. Within a few years of its birth, WOWO's power had grown to 10,000 watts, making it Indiana's most powerful station. By that time, the station had moved to new studios on Harrison Street, in a building now occupied by the Bonsib advertising agency. WOWO moved to the Gaskins Building on W. Washington Street in 1950 and to its present Central Building location in 1977. The Westinghouse Co. acquired WOWO in 1936. Now, the station has changed hands again. The Price Communications Corp. purchased the station last month for $6 million. Quite a lot of money for a station which once shared small studios perched atop an auto parts store.